What is Shiksha New York? Shiksha New York is a new enrichment school in Queens, New York. Shiksha New York is a vibrant and active educational community that provides enrichment classes to students aged 4 to 18. What kind of classes does Shiksha New York offer? Shiksha New York offers 11 different classes in the diverse areas of classical music, dance, drama, language, Hinduism, yoga and academic enrichment classes under one roof. When and where are Shiksha New York’s classes held? 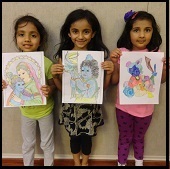 Shiksha New York’s classes are held at Radha Govind Dham, 260-01 Hillside Ave, Glen Oaks, New York 11004. Shiksha New York’s calendar follows that of New York school system – providing a consistent, year-long extracurricular enrichment for children and youth. Please refer to Calendar for more detail. Calendar available on website for the details. Online registration available now. How old does my child have to be to attend Shiksha New York? Different classes at Shiksha New York have different age requirements. Please refer to Classes description for more detail. In general, Shiksha New York accepts students aged 4 to 18. Are classes at Shiksha New York free? No. Only Mandir Seva classs is free. Each class has a fee and fees are indicated per semester. How will Shiksha New York benefit students? Students are the focus of Shiksha New York. As parents, we feel responsible to introduce our children to the customs and traditions we grew up with and value so much. We also want to make sure they learn properly and from qualified teachers. At Shiksha New York, students choose from a variety of extracurricular topics and learn the subjects of their interest from qualified teachers. In addition to enriching children’s spiritual and cultural development through traditional classes in Hinduism, Dance, Language and Music, Shiksha New York teaches them unique skills they can use to excel among their peers in school. Being at Shiksha New York opens doors for our students to explore the many treasures of Indian and Hindu culture. Classes are small so that the unique strengths of a student can be supported and brought out. Students will gain an educational ‘edge’. Shiksha New York will provide an environment where students will want to come back to, enjoy learning with others and apply what they will learn. Students will create friendship that can last a lifetime. What can the parents expect by sending their children to Shiksha New York? First, almost all of our teachers here at Shiksha New York are parents themselves. They are not only friendly, caring and trustworthy, but they are also experts or performing artists in their respective fields. Many have won awards and recognition for their work. Parents can expect classes at Shiksha New York to be structured, regular and taught by passionate, dedicated and qualified teachers. The school year is divided into two semesters. Our teachers will follow a well-defined, comprehensive curriculum during these semesters. And most importantly, Parents can expect their children learn to excel at what they do best while being in a safe, nurturing environment of the most caring teachers. What can I do as a parent when my child is attending a class? You’re welcome to observe or volunteer in the classes while you’re kids are learning. We have a small library where you can enjoy devotional and philosophical literature. Shiksha New York is located at Radha Govind Dham New York, which is in the heart of the Indian shopping district of Hillside Avenue in Floral Park, Queens. You can take advantage of the time to do all your shopping. How many subjects should I register for? We encourage every student to register for all the subjects they are interested in. Is Shiksha New York a non-profit organization? Shiksha New York is part of Radha Govind Dham New York, a non-profit educational organization and was created to provide cultural educational opportunities to the youth of New York.